October’s book for my 2008 Reading Challenge was Ford Madox Ford’s The Good Soldier . Like many of the books I chose for my challenge, I knew almost nothing about it. I knew it existed; I’d probably seen mention of it in various places, not to mention catching sight of it on the “classics” shelves in my local Waterstone’s. But I knew nothing about Ford – who he was, what part he played in English literature, or even what was the general reputation of The Good Soldier . And that’s one reason why I chose it. The other reason is that it’s a slim novel – I’d have liked to try a James Joyce novel, and I have a copy of Ulysses … but it’s huge (I also own Anthony Burgess’ Here Comes Everybody , his study of, although there’s little point in reading about, unless I’ve read Joyce, Joyce, Joyce*). The novel is set just prior to World War I and is narrated by John Dowell, a wealthy American mostly resident in Europe. He and his wife, Florence, spend several months each year at Nauheim, a spa in Germany. While there they’re chiefly in the company of another couple, Edward and Leonora Ashburnham, who are English. Edward is the good soldier of the title. Dowell’s narrative skips about in time, describing incidents in no particular order from the decade or so during which the Dowells and Ashburnhams are friends. What Dowell does not initially reveal – although it’s later clear that he knows it at the time he is recounting the story – is that Edward is a philanderer and having an affair with Florence. And she has also had a succession of lovers – beginning with a blue-collar thing, Jimmy, whom she was sleeping with when she married Dowell. As The Good Soldier progresses, Dowell reveals more and more of the peculiar dynamics between the two couples. When Florence learns that Edward has fallen in love with Nancy Rufford, the ward of Edward and Leonora, she commits suicide. Edward also commits suicide later, when Leonora sabotages Nancy’s burgeoning love for him. 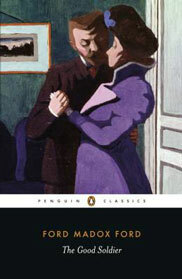 Ford originally titled the novel The Saddest Story, and Dowell repeatedly describes the story as the saddest he knows. Perhaps too often. I can understand how a chronologically non-linear narrative might have been seen as something new and astonishing in 1915, when the book was first published, but it’s an unremarkable technique nowadays. The same is also true of using an unreliable narrator (if you’ve read anything by Gene Wolfe, you’ll be only too familiar with unreliable narrators). Which means that much of what’s interesting about The Good Soldier is no longer the case. The book does, however, give a good indication of what life was like for wealthy Edwardians – for example, Edward is almost sent to prison for kissing a maid on a train. That “consorting with the lower classes” was a crime then seems completely bizarre. Ford’s maintenance of Dowell’s voice throughout The Good Soldier is impressive. Not once does he let his character slip. Unfortunately, far too much is told rather than shown. I suppose in part that’s the nature of a recounted narrative. It’s also perhaps the fashion of the time. But it reads somewhat distant to a modern reader. In all, I find it hard to consider The Good Soldier as good as its reputation. I enjoyed reading it, and it’s a clever evocation of Edwardian England. But its two innovations – a non-linear narrative and an unreliable narrator – are neither as remarkable as they were in 1915. It’s by no means a difficult read, although it is difficult to care about the characters – which is hardly unsurprising, given that they’re hardly pleasant people. “Good people”, perhaps, but not pleasant. Having said that, I think I rate The Good Soldier higher than some of the books I’ve read during my challenge. But The Jewel in the Crown remains the highwater mark, and A Question of Upbringing a distant second. * to spoof Burgess’ infamous: “He breathed baffingly on him, for no banquet would serve, because of the known redolence of onions, onions, onions” in Enderby Outside . Categories: 2008 reading challenge, book review, books, ford madox ford | Permalink.